American Girl’s mission is to celebrate girls, and Cards2Cash can help you do that for less. 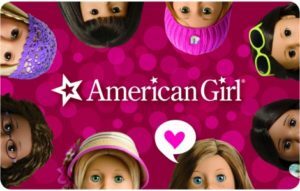 The signature dolls from American Girl can cost a pretty penny, but with a discounted American Girl gift card you can save at their stores and on their website, AmericanGirl.com. American Girl offers a collection of premium dolls, books, toys and creative accessories. Their products help to affirm self-esteem, celebrate feminine achievement and foster creativity at each stage of a young girl’s development. They are appropriate from preschool to the tween years. Do you know a young girl who has been longing to add to her American Girl doll collection? If so, surprise her with the “Girl of the Year.” This is a collectible doll that celebrates diversity and empowers girls to stand up for what they believe. But American Girl dolls aren’t just toys, they also have the ability to teach young ladies about history, cultures and customs from around the world. Want to really see a girl’s face light up? Get her a customized TrulyMe doll that looks just like her! In addition to purchasing new American Girl dolls and accessories, use your discounted American Girl gift card to pay for in-store services. The stores offer spa packages, hair styling and ear piercing for your girl’s doll. Or treat your favorite girl (and her doll) to a meal she’ll never forget at the American Girl Bistro. Offering brunch, lunch, afternoon tea and dinner, you can make this a special mother-daughter outing. You can also plan an extravagant birthday party for your favorite little princess. And of course, an American Girl gift card also makes a great gift for the child who seemingly has everything. Regardless of how you plan to use your gift card, know that with Cards2Cash, you’ll never have to pay full price for those priceless American Girl memories again. Looking to Sell your American Girl Gift Card? Do you have an American Girl gift card you aren’t going to use? Cards2Cash will turn that unwanted card into money! We buy gift cards for most nationally known retailers, including restaurants, stores, and websites! If interested, visit one of our retail locations, and we’ll pay you for your unwanted card, OR you fill out our easy online form, and we’ll get back to you with an offer you won’t want to refuse. Whether buying or selling a gift card, Cards2Cash is your one-stop gift card shop!